DNA STARPOOL Paths and treatments that make use of heat, water and relaxation. â&#x20AC;&#x153;This formula, with its ancient origins, is the true essence of every Starpool spa. We express our passion for the culture of well-being through the design and constant search for quality of our products and services.â&#x20AC;? 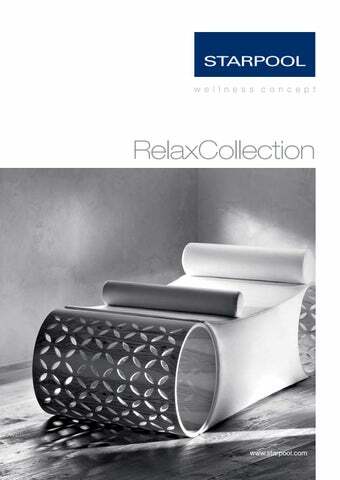 All products in the Relax Collection have been planned by Starpool. RELAX COLLECTION IS Ergonomic, sleek lines, naturally inspired materials and an eye for detail: these are the main characteristics of Starpoolâ&#x20AC;&#x2122;s range of products dedicated to relaxation. The forms follow the lines of the body, turning rest into a moment of true well-being. The choice of coverings and fabrics ensures the highest levels of comfort. The Relax Collection ensures that well-being is not the exclusive right of hotels or fitness centres, but can also be part of daily home life. The Relax product range Designed for Starpool by the renowned designers of Made in Italy, these loungers are stylish items of furniture for fitness centres, spas and private homes, combining classic and contemporary taste. The functional design offers differing technical performances, while the vast range of fabrics and colours means that Starpool loungers will fit into any type of ambience. A SOFT EMBRACE A chaise longue in which to relax, read or meditate. Enveloping and ergonomic, Starlongue has been designed to ensure perfect rest. Its rounded, sinuous forms hold the body in a soft embrace, while its dynamic, sleek design is further emphasised by elegant coverings, embellished with visible stitching, providing these loungers with versatility and adaptability for every ambience and style. The ergonomic form of Starlongue guarantees optimal adhesion of the body: the legs remain raised with the knees slightly above the height of the heart, thus stimulating the circulation. 2_SLIP-RESISTANT SUPPORTS The structure is supported by four invisible anti-slip supports to guarantee perfect stability. The high-quality finishes with seams delineating the outlines lend the fabric maximum stability and durability. The quality of the coverings meets the highest standards. Sturdy and stable, yet thanks to its wooden frame very light: filled with non-deformable polyurethane foam covered in padded Dacron. PURE ELEGANCE StarLit is distinguished by the softness of its lines and the strength of its ideas. The design offers a reinterpretation of the classic â&#x20AC;&#x153;dormeusesâ&#x20AC;? of the bedrooms and parlours of the noble residences of the 18th century: these special divans were already in use in Roman times, not just for rest but also as seating at lunch and dinner times. As well as being extremely versatile, StarLit becomes an item of furniture that adds elegance to its surroundings. The precious olive wood is further emphasised by the elegant fretwork that recalls the line of the leaves. With its almost golden tones streaked with a rich brown, olive is a hard wood, compact and homogenous, resistant to woodworm and ideal for the manufacture of fine furniture. Sturdy and stable, StarLit is also very comfortable thanks to its polyurethane foam filling with visible seams that ensure high stability for the fabric covering. The two cylindrical cushions have different diameters to maximise user comfort: the neck and legs are supported at two different heights that can be changed according to individual needs. COMBINING LIVING AND BEDDING DayBed is simple and sleek. The high quality of fabrics and finishings combine in a language of clean lines of the oak structure, which offers free space for the enveloping comfort of the mattress. A timeless style and identity suited to any surroundings, providing a pleasant opportunity for healing relaxation. The perfect combination of living and bedding finds its expression in the backrest which can be adjusted to various positions. In the raised position it becomes the perfect seating for relaxing during the day, while it can be used as an actual bed when flat. The oak base gives the bed a natural feel through its simple yet attractive design. The varnished base and the feet for raising the seat also allow DayBed to be used in damp environments, such as next to the pool. The wooden panel under the backrest optimises space usage, offering a functional support for personal items while relaxing. Rounded corners, soft filling, a seam that separates the backrest from the seat (avoiding uncomfortable creases from forming in the raised position) all make DayBed a comfortable, wide and soothing place to sit or lie that evokes memories of well-being. DayBed has casters at the back to protect flooring and permit easy moving. SLENDER FORMS Sleek design and a rich personality for a lounger that gratifies both body and surroundings. Designed with a soft and anatomical line that is a comfortable place to stretch the body with discretion and elegance. The softness of the seat contrasts with the linearity of the oak wood base, conveying lightness and harmony of proportion. Its minimal design is a perfect synthesis of cleanliness, comfort and refinement. The minimal and elegant lines of the whole consist of a single, sinuous surface for the seat and a solid, non-obtrusive base for the structure. Two superimposed forms, distinct and visually separate, are connected by robust joints to ensure maximum stability and durability. A slender yet comfortable mattress, no more than the essential, provides maximum comfort. Bridge is lightweight and easy to carry. The enormous versatility of Bridge makes it suitable for any environment: spas, wellness centres, swimming pools, home relaxation areas and even as furnishing for living or sleeping quarters. SINUOUSLY COMFORTABLE With its elegant lines, Synua is designed for complete relaxation with harmonious proportions, carefully calibrated, and an enveloping backrest and soft cushion headrest. The base, of oak, gives character and style to the whole. Available in leather or fabric, it will make the idea of rest more attractive still. The ergonomic, sinuous, shape of Synua â&#x20AC;&#x201C; hence the name â&#x20AC;&#x201C; ensures optimum adherence of the body and denotes its versatile character, the result of careful, formal research that guarantees the best possible comfort. The cushioned headrest can be adjusted in height and has been designed to improve posture while resting or to facilitate reading while relaxing. The simple, elegant base of natural oak or wenge-tinted oak is connected to a polished aluminium bar that gives the seat a marked air of determination. The soft polyurethane foam filling covered in padded Dacron and the highest quality fabrics make this chaise longue the ideal place to indulge in the most absolute peace and tranquillity. MARBLED REST The unique structure of SweetChair provides a seat that combines design and technology. The precise ergonomics and extreme versatility of SweetChair make it the ideal choice for either professional or home use. You only need a moment to appreciate the comfort offered: a fully adjustable reclining backrest and heated marble slab to produce an unforgettable sensation of relaxation. SweetChair has an infrared heating system as standard that releases and transfers heat over the entire surface of the stone. The digital thermostat can regulate the temperature up to 41.5Â° C, transforming the smooth and silky surface of the marble into an alcove of perfect rest. 3_WATERPROOF STRUCTURE The waterproof structure of this chaise longue makes it suitable for indoor and outdoor use even in particularly damp locations. With its soft leather headrest, SweetChair becomes the ideal bed for indulging in warm, comfortable rest. SweetChair has casters to protect flooring and permit easy moving. Automatic full adjustment of the seat angle allows everyone to find their ideal position for relaxing or reading (optional feature). SweetChair complies with current European standards. Starpool reserves the right to modify/adapt the technical data and dimensions of the product, even without notice. If the buyer wishes to install SweetChair in countries outside the EU where standards are different from European CE standards, the buyer must notify any additional requirements to Starpool. N.B. : colours are purely representative and actual fabric may appear different from printed image. See RelaxTiling for the best view of type of texture and colour. Visit the Starpool online portal to find your well-being solution. Information on the company, relevant product technical notes and Starpool references from around the world can also be found online. 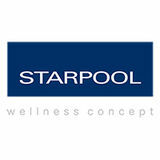 Starpool, Wellness Concept, Sweet, Mediterranean Bath, Rivestimento Milano, Rivestimento Cortina, Relax, Excite and Purify are all trademarks of Starpool s.r.l. and are registered in the countries of the European Union and worldwide. SweetProMed, SweetProSauna, SweetProSteam, SweetSpa, SweetSauna50, SweetSense, SweetSauna90, SweetSpa Eramosa and SpaTable are patents, models or filed patents of Starpool s.r.l. in the countries of the European Union and worldwide. Starpool® reserves the right to change its products and literature without notice as part of its continuous process of product development and improvement.